This is a really cool collection I have. All the bags featured in this section have polypropylene straps with adjustable release and lock hardware. The straps are rather easy to adjust the size to a shoulder bag or across the chest to the side look. I have many other patchwork ones in different color schemes and special orders are definitely welcomed. Comes with a free coordinating pouche. The Midnight Blues patchwork bag has a cool 1 inch black polypropylene straps with blue adjustable hardware. 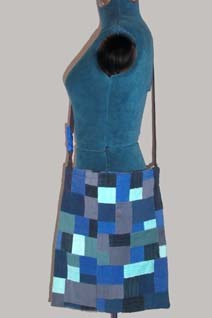 The bag is patchworked in thin to wide wale corduroy in navy, slate blue, teal, electric blue and seafoam. The bag is 12 1/2 inches by 14 1/2 inches. This is a super cool adjustable strap bag. 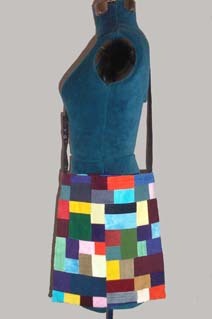 Most of the colors were carefully hand dyed to create a wonder rainbow corduroy patchwork bag. The bag has 1 inch black polypropylene straps with adjustable black hardware. Also has a lightweight black denim lining. The bag is 12 inches by 13 inches. This is a little cute bag, not too big and not too small. 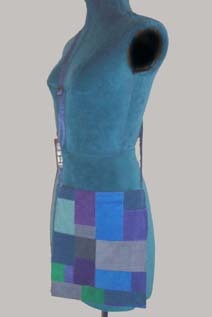 The bag has purple, navy, green, electric blue, slate blue and blue corduroy patchwork with a cool lavender lining. It is equipped with a 1 inch navy polypropylene with black hardware. The bag is 9 1/2 inches by 11 inches. 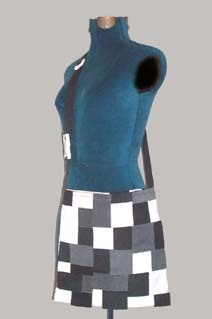 The Salt & Pepper patchworked adjustable bag is in black, gray and white medium wale corduroy. It has 1 inch black polypropylene strap with white hardware. Also has a black lightweight denim lining. The bag is 12 1/2 by 12 1/2 inches. This hot, hot pink patch is one of my favorites too in my collections. 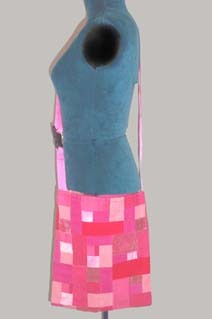 Made of various pinks & reds in corduroy & velvet, and of course, some of the fabrics were hand-dyed by me. 1 inch hot pink polypropylene strap with black hardware. The bag has a hot pink lining. It is 10 1/2 inches by 12 inches. 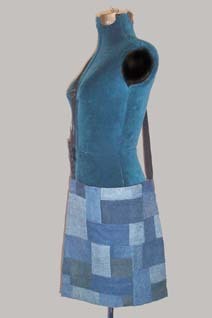 This is a great denim patchwork bag that matches just about anything. There are about 5 different shades of denim. Equipped with 1 inch black polyproplene strap and black hardware. The bag is 14 inches by 14 inches.